I started writing poetry when I was very young, so I can't remember a time, when it wasn't important to me. I fell in love with Dr. Seuss and Robert Frost and developed my own sentimental style. I usually write poems in rhyme, but not always. However, as someone once told me, if you can be moved by your own writing; somewhere, someone else will be moved by it too. So I try to write about subjects in my poetry that move me, or that I know have moved others around me. Sometimes my poetry has specific meaning, sometimes with specific people in mind. Sometimes, they just pop into my head and I have to write them down. Poetry is like meditation for me. Sometimes, if I can't sleep, I'll write a few poems to relax. It usually helps. Last year at the request of a friend, I was asked to write a poem about graduation. It was a subject that I wanted to tackle for a long time, but I knew that when you are talking to graduates, it has to ring true. It has to help them to move forward and be fearless in their pursuits. And even though it's been years since my own graduation, and my children have already graduated too, it was my new endeavors as an author, not only of poetry, but an author of children's books, and time travel and romance and just about anything else, that inspired me to write a poem that may resonate with others to follow their dreams as well. It doesn't really matter how old you are when you graduate, I myself didn't finish college till my early forties. What matters is, knowing that when your education is done, what you will do with it. What you have learned, how you may inspire others with all the new knowledge in your mind. This is what I had hoped to express to others in my graduation poem. While I still had self doubts about pushing that publishing button, and letting the world view my work, it made me keenly aware, that my work is my own. That the things I've experienced in my life, belong only to me. And that only I could be an expert on creating poems and stories, using that unique life and education experience. That's what I wanted the graduates to know. Especially the young graduates from high school and college. That it doesn't matter what you choose to do in this life, your experience will make your choices uniquely your own. And what has taken me a half century to figure out, I can now say with certainty, that your heart truly knows the way to go. There have been many times, when I've thought about not writing anymore. This is a tough business. But each time I've stopped, my heart wouldn't let me. So I've given up stopping. I've given up trying to give up writing, I love it too much. I've learned not to fight that inner spark. What you dream all your life, you really can do. I may not be wildly successful, but my heart is happy with the journey, and that's what matters most. Look at more cards from Zazzle. Now you can customize this unique sentimental poem with your own school colors. 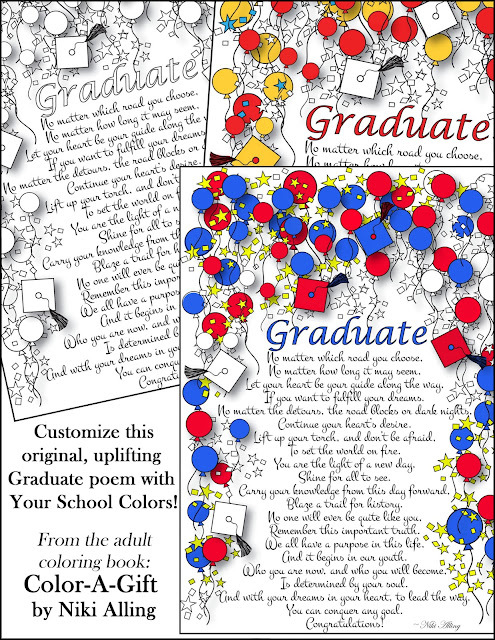 This Graduate poem is included in our adult coloring book, Color-A-Gift. Click the image to go to the book at Amazon. ON SALE .99! Limited time!